We are eight friends who met online in 2012 when we joined the inaugural Romance Writing Program at McDaniel College. In the ten months that followed, we lost many a night’s sleep, cried a little, laughed a lot, learned our craft, and got to know each other’s stories nearly as well as our own. When the program finished, we realized we weren’t ready to stop. We wanted to keep talking, arguing, encouraging, and pushing each other to make our books better. Some of us are already published, some us are striving towards that goal. We live very different lives in very different places, from the heart of the city to deep in the countryside, across four states and on three continents. Among us, we’re writing historical, contemporary, magical, suspenseful, romantic, smart, funny, moving, character-driven fiction. We’d love you to join us as we share what we’ve learned, what we’re writing, and how we’re doing. Michille fell in love with the romance genre in high school when she pilfered her first romance novel from her grandmother’s bookshelf – Devil’s Desire by Laurie McBain. She has been reading romances ever since and has watched the genre evolve quite a bit since that book was published. She has always been an avid reader but never considered writing fiction as a career until a couple of years ago when the voices in her head got so loud that she had to start writing them down. Michille’s day job is writing grants for the local school system, but her dream job is writing contemporary romance full time. 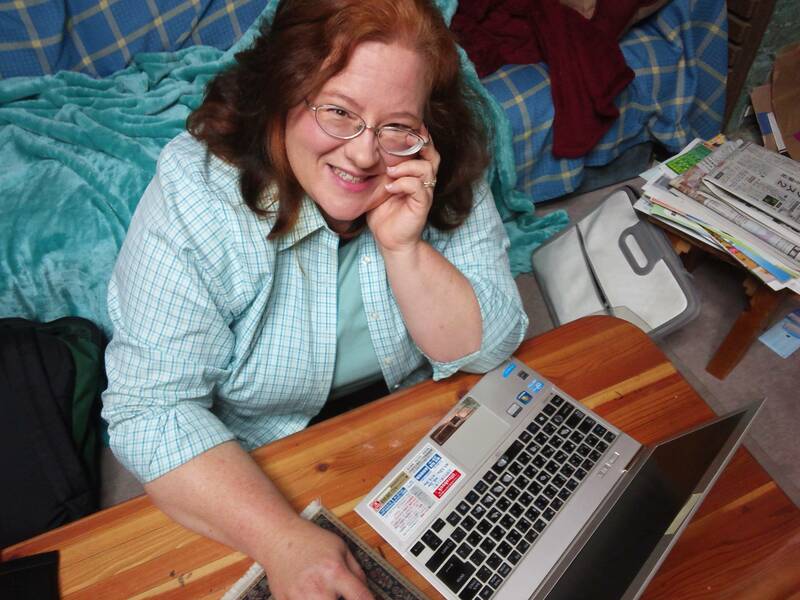 In pursuing that goal, she completed a Post-Baccalaureate Certificate in Writing the Romance Novel from McDaniel College in Westminster, Maryland and is continuing to learn the art of good fiction writing. Michille is currently working on a four-book series featuring the Callahan family. She is hard at work on the third in the series and applying all her new-found craft knowledge to bring the Callahans to life on the page. You can also keep up with Michille by visiting her website. Justine has loved history since she was little. Growing up in rural Maryland with a corn field in her back yard, she used to play “Laura Ingalls Wilder,” making corn cakes and other “pioneer” food in her sandbox. She’s loved books just as long. The best punishment she could receive as a child was being grounded to her room where she could read uninterrupted (sometimes for days). After college, Justine chose a practical career and began a fifteen-year stint as a technical writer, trainer, and software designer, then quit it all to start a family. Five years later, the kids were in school and Justine decided it was time to write the Regency historicals she loves, rather than simply read them, so she enrolled in the inaugural class of the McDaniel Romance Writing Program. It turned out to be one of the best decisions she’s made, not only because of what she’s learned, but because of the friendships she made with other women as passionate about writing as she is. Knowing there are other writers out there juggling little kids, family, and writing, Justine joined Eight Ladies Writing to share her experiences and knowledge (and commiserate a little, too). She’s currently working on the first of several books in The Beggars Club series, about a group of friends from Eton. You can also visit her website. Michaeline lives in Japan. Her day job is teaching English, her night job is writing science fiction and urban fantasy, and her hobbies include posting on the internet. She gets to play with words all day long, which is a great way to live. She studied under the fabulous Jennifer Crusie in 2012 and 2013, and earned a Romance Writing Certificate from McDaniel College in the process. Along the way, she met the wonderful women whose blog posts you have been browsing today, and is so pleased to be part of the continuing conversation about writing and writing careers. She is working on The Djini and Ms. Jones (a full-length urban fantasy). For more information, please visit her website or talk to her on Twitter or Google+. Born and raised in Northern California, Elizabeth has been an avid reader for as long as she can remember. As a child, when forced to go outside to play, she could usually be found hiding up in the tree in the front yard with Nancy Drew, the Hardy Boys, or Judy Bolton as companions. Her first job was in the book section of a local department store, where she was hard-pressed not to spend all her earnings on books. She started writing poems and stories and dreamed of being published “someday.” In college the English department beckoned but practicality triumphed and Elizabeth obtained a degree in mathematics instead, embarking on a career in the computer software industry where writing opportunities were limited to computer code and user manuals. About three years ago Elizabeth looked at the calendar and realized that “someday” had arrived. She dusted off her old writing journals and began the study of craft at a local university where she produced a number of short stories. Ready to take her writing to the next level, Elizabeth then joined the inaugural Romance Writing program at McDaniel College and began writing in earnest. Now she’s happily combining her passions for the Regency era, strong heroes, and resourceful heroines in a Regency suspense novel that is a blend of romance and mystery with a side of humor thrown in. Nancy spent her early years wanting to be an English countryside vet thanks to James Herriot’s All Creatures Great and Small series, and an adventurist/archaeologist thanks to George Lucas’s Indiana Jones character. After studying veterinary pre-med and earning an anthropology degree, she realized her true passion is really stories. Always excited to learn more about crafting great stories, Nancy wanted to enroll in many writing programs over the years, but none of them were the right fit until she found the McDaniel Romance Writing Program. The very first day of the very first class fell on Nancy’s birthday, and it turned out to be one of the best birthday gifts she ever received. Nancy writes in multiple genres including women’s fiction, urban fantasy, and paranormal romance, but all her stories are about smart, adventurous women and the men strong enough to love them. Her first book, a paranormal romance titled Taste of Liberty, was published by Blush and is available on Amazon. Her current work in progress is a women’s fiction book tentatively titled Kiss the Bride Goodbye. Nancy lives in Maryland with her real-life hero/husband and many, many rescued cats. You can learn more about Nancy and her books at her website. Jeanne wrote her first short story in third grade, a tale of birth-control-challenged bunnies who named their children in alphabetical order—Alice, Benjamin, Cathy, Dexter—all the way down to baby Zachary. Later that year, when given an assignment to depict what she wanted to be when she grew up, Jeanne drew herself in a floor-length, crayon-blue dress, sitting at a typewriter. Life has a way of handing us detours, though, and Jeanne wound up earning her degree, and her living, as a computer analyst. She continued to write at night and on weekends, but she could never quite manage to write anything that satisfied her. But she didn’t give up. In 2012, she returned to college to earn a Master’s Certificate in Creative Writing at the Nora Roberts’ School of Romance Writing at McDaniel College. Working under the mentorship of NYT Bestseller and former high school English teacher Jenny Crusie, Jeanne wrote a paranormal romance that went on to win the 2015 RWA® Golden Heart®. The Demon Always Wins, the first book of her Touched by a Demon trilogy of paranormal romances, debuted in September 2018. Kay was born and raised in Wisconsin, where long, cold winters and short, hot summers are conducive to reading. By the second grade, she’d written a fan fiction of Goldilocks and the Three Bears. In the fifth grade, she shelved her book about a talking crow after she got stuck in the sagging middle. This event was her first realization that conflict would be her narrative downfall. She embarked on a career in journalism. While editing a newsletter for mystery readers, she stumbled into a panel of romance writers, where she heard Jennifer Crusie and other writers talk about their work. She streaked to the library and read all of Crusie, Georgette Heyer, and M.M. Kaye. Christmas! After 9/11, she wanted to create happy endings, and she started to write romance. But she had not yet learned the sad lesson of the talking crow. When she heard that McDaniel College was offering a romance writing program and that Jennifer Crusie would teach it, she signed up. She is now working on a contemporary romance that has, she hopes, both a ton of conflict and a happily ever after. Kay wishes she could report that she has mastered conflict. Alas, as she learned in class, it’s a process. Learn more about her at her website. Jilly is a former CEO and CFO who quit the corporate arena because writing love stories is a lot more fun than reading contracts or filing accounts. She now writes epic fantasy and contemporary romance from the sofa of her Victorian house in a quiet corner of London, England. Jilly lives with her husband of more than 30 years, a man who loves murder mysteries and hates yucky emotional stories, but who is nonetheless her biggest supporter. She considers herself a very lucky woman. Eight Ladies Writing features another writer (also from the McDaniel Romance Writing program) who posts semi-regularly. Kat Kaiser began her storytelling career early in the backyards of the southwestern Ohio town where she lived. Her stories featured a brave little girl, who, along with King the Wonder Horse (a rope tied to her bicycle handlebars), had adventures and boldly conquered the world. When a school librarian turned her on to the story world of books, Kat stabled King and immersed herself in other people’s stories. For years Kat was content to be a reader, until a personal loss reminded her of the importance of pursing her dreams. Writing her first novel was liberating and rekindled her creative spark, but it also taught her how much she didn’t know about writing. She enrolled in the McDaniel College Romance Writing program where she learned to apply the tools necessary to write a really good story. Today, Kat’s writing features strong women pursuing romantic, adventurous lives. She’s in the process of finishing her second novel; a contemporary romance about a bold protagonist creating a new life for herself. Kat came to writing rather late in life, but that brave little girl and her horse King, continue to spur Kat’s imagination as she continues her storytelling career. To find out more about Kat, check out her website and blog. Hello – I followed the link over from Argh Ink and I’m really glad that I did. I’m in the same position as most of you – working hard to become a published author but not there yet (although, sadly, not having done the MFA course with Jenny Crusie) – and I’ve found the posts I’ve read so far to be both interesting and super useful. One of my NY resolutions is to become more active on the writing threads I lurk on. Truthfully, though, I always feel as thought I’m eavesdropping on Argh Ink and it seems a bit presumptuous just to jump in, so I’m hoping that you won’t mind if I start my resolution by commenting here and work up to that! Hi, Rachel, and thank you for your kind words. We’d love to have you drop in and chat any time. If you’re working hard to get published hopefully we can learn from one another. I know what you mean about Argh – I’ve been lurking on Jenny’s blogs for years and I only got over my reluctance to comment by signing up for the McDaniel online course. Now I’m looking forward to the Sherlock discussions and wondering why I waited so long to join in the fun. Look forward to seeing you over there, too, when you get comfortable with commenting! I second what Jilly said, Rachel. I’m a big lurker. I still haven’t worked up the nerve to comment on Jenny’s blog. Good luck with your writing in the new year. I have become a craft junky and read all kinds of books and blogs now which I never used to do. New perspectives or old themes revisited are both so helpful. That first blog comment is always the hardest. It’s awesome to have you here and we’re so happy you jumped right in. I second what Kat says! Welcome, Rachel! Thank you all for taking the time to reply. Keep up the posts and I will keep commenting. Today I have a day off work and am scheduled to finish (yes, finish) the first draft of my WIP – about 4K words to go, so I’d better get to it. I just finished the first draft of my first WIP and the Ladies will tell you I celebrated! I am now working on revision and it’s exciting to be in this different phase of my story. Good luck today and I hope you reach your goal!! I mentioned your blog in reference to the Versatile Blogger Award. Check out the post and participate as much as you like. No obligations from my end. It’s a chain mail type of blog award. Thank you for your work and time! I just discovered your blog in the process of looking for nominees for a Liebster “Award” today (see my post: http://audreykalman.wordpress.com/2014/02/07/leaping-liebsters/). As you can tell, I’m taking it with a grain of salt, but it was a great opportunity for me to discover new blogs. Do with it what you will. And I love the idea of a multi-hosted blog. I look forward to hearing your varied voices!